November 2009 - Pebbles, Inc.
My name is Mireille and I will be your host for this week. Can you believe it will be December tomorrow?? I look at November and December as “celebration” months. All over the world there are so many celebrations based on culture, religion and location. There are celebrations such as Saint Martin, Halloween, Thanksgiving, Sinterklaas, Hannukkah and I think Christmas would be the most well-known worldwide. There are enough celebrations to scrap about and that’s exactly my challenge for this week! Since I live in the Netherlands I cannot tell you much about Halloween or Thanksgiving for example but we do celebrate “Sinterklaas” and I thought it would be fun to scrap about that. Sinterklaas is a celebration for children. Sinterklaas = Saint Nicholas was a saint that was well known for his generosity. Saint Nicholas arrives on his steamboat from Spain halfway through November. He brings his horse, Amerigo, and a lot of helpers, “Black Petes” (that are black from their work in the chimneys). They stay here for about 3 weeks. In these times you can see them everywhere. In the evening before they go to bed children get to put their shoes close to the fireplace, sing special Sinterklaas songs and if they have been “good” they will get a little candy or a small present in their shoe. On December 5th we celebrate “Saint Nicholas Eve.” This evening Saint Nicholas or Black Pete drops presents by. Sinterklaas is celebrated mainly in Europe. Pictures of my son on Zwarte Piet’s lap on Saint Nicholas eve. He was a little scared but after a while he really liked it. I used the cute houses stickers from the Downtown collection because Zwarte Piet works on the roof of houses all night- bringing candy and gifts through the chimney! Liz made this layout with the Pebbles Season’s Greetings collection. I’ve been seeing a lot of trees out there and love the way it decorates a page. Liz even provided us – and you – with a sketch to use. Isn’t that awesome?? Made this beautiful layout using the Skipping Along, So Tweet and Linnie Bell collection. Deanna covered the edges of the paper with Pebbles Metallic Chalks to give a “snowy” effect. She added embossing ink to the page and then covered with the chalk. Notice the “ornaments” she made out of the circle chipboard shapes. And look at the beautiful Christmas Tree decoration Samantha made. I love Ginnifer’s layout and the atmosphere this breathes. A warm family atmosphere on Christmas Eve when the family sits together and opens up their presents. Notice the wrinkled paper ribbon at the bottom. TGIF !! It’s Friday !! To end off the week, we shall wrap up with mixing patterns ! I remember when i started scrapbooking, i was introduced to the gallon-pint-ounce approach. This general rule of thumb helps to guide the amount of color you use on your page. The gallon is your dominant color which translate to your background dominant color. The pint is your secondary choice color . Lastly, the ounce color could simply be the color of your embellishments. I used a neutral background to neutralise the busy prints. This makes the card look more finished. example :brown, grey, black, white, cream etc. This would mean choosing a color and varying its shade. 4)Select a very different pattern that’s half the scale or size of the first pattern. If your first pattern is a large floral, the second pattern could be a plaid or geometric shape that has some of the same colors. By no means is this list fixed. These are purely my sharing and experiment. Do let me know what you think. I would love to hear from you too ! Here is Akiko’s colorful page. The use of cardstocks on the layout and as a frame around the photo is so clever! It gives the eye a space to “rest” and make the layout less busy. Susan Dupre created a fabulous layout. I Love her playful mix of papers to create the patels ! What a great idea to use a less busy graphic pattern as her background too ! Gaelle’s super adorable layout features a creative banner where she doodled. How fun a mix of patterns and elements ! Lastly, i created a card using the gallon – pint- ounce approach. and stripes in ounce quantity. A Big thank you to ALL the fabulous ladies who played along with me this week ! Thank you for your inspirations ! Hope you’ll have a Happy Start to a Great Weekend !! and Happy Thanks Giving ! Heather Bailey‘s fabrics are so rich in color and so inspiring. Each time i look at her yummy colored designs, my creative cells starts to run amok…take a look at this piece , the color combination – isn’t it inspiring ? and here’s somemore to tantalise your color senses ! the color schemes are so vivid and interesting! So, why are colors important in your scrapbooking projects ? Colors set the mood of what you want to portray in your creations and evoke emotions. Color can be made to harmonize and blend with the rest of the scrapbook elements. Really, you don’t even need to know the difference between primary and secondary colors to create a page that complements your photographs. All you need to find color inspiration for your layouts is a watchful eye during your everyday life. Color palettes are all around us. So there, some colors to brighten up your week. Have fun exploring colors and … Happy Mid-week! Good Monday everyone ! Welcome to a brand new week ! My name is Emeline and i am your blog host for this week. The challenge this week : show us your favorite color combination. Color is somehow scientific and it plays a huge role in the overall look of our scrapbook pages. I LOVE colors and i love to mix them. The ingenious color wheel is an invaluable tool for you to have fun with colors. Try using the color wheel to design well-coordinated eye-pleasing pages that really shine ! let us pick the color green. Since every color comes in many saturations and hue, choose two or three additional values of the green color you want to use. The result will be calming and cohesive. Your page should turn out to be pleasing to the eye and stylish. Choosing colors across the wheel from each other creates contrast and is a good way to make the items on your page stand out. Lisa Warren used a gorgeous combination to create a boyish layout. Cherie Nymeyer used a soothing color palette on her page. 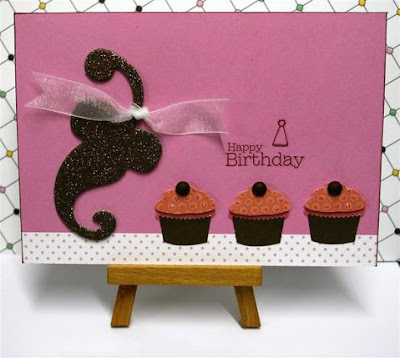 Liz Qualman created an adorable card using the fabulous color combination. Look how she utilised Pebbles Inc Linnie Bell sticker ! How cute ! and lastly, i used complimentary yellow and pink (together with neutral colors grey and white). I would like to share with you, my favorite project for the holidays! 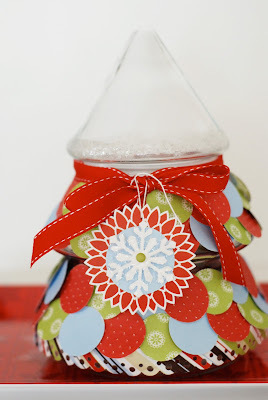 I took a basic Christmas Cookie Jar, and decorated the outside, with just a few punches! As you can see I used two different size circle punches, in three different patterns to begin layering around the jar. I did emboss one of the circles to give it some texture. I used one craft glue dot on the back of each circle. I failed to mention that I added a border punch strip to the bottom of the jar. Border punches are not just for pages! 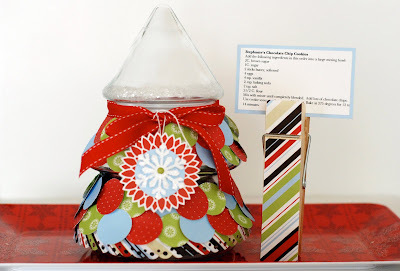 These jars make such a great gift for the holidays!! I am making a few of them, and adding my favorite cookie inside. These will be fantastic gifts, for teachers, neighbors, friends, etc. You can add another special touch, by including a copy of the recipe! Who does not like homemade cookies? You could make one, and set it on display in your kitchen for the holidays! This project was super easy with a few punches, and fun to decorate! I would love to share with you, other projects made by the design team! Seriously, more eye candy to inspire you for the weekend! 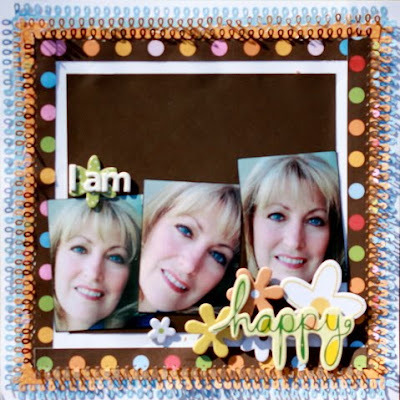 Susan, used border punches around her scrapbook page. The double borders, framed her pictures perfectly! Your eye is immediately drawn to the gorgeous pictures! 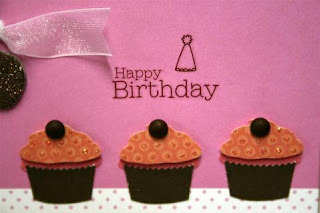 Sophia, used cupcakes as the focal point in her card. She added extra details to them, by using a punch to give the appearance of icing! A very “sweet” card! 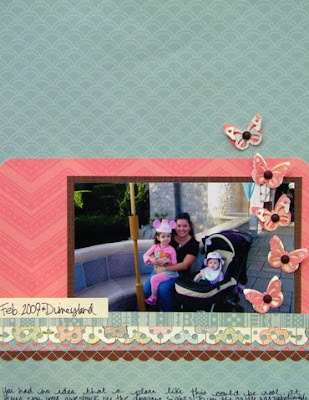 Samantha finished her layout by embellishing with a butterfly punch, and layering two butterflies together. The design is clean lined, but makes such a big statement! Cherie layered two circle punches, and adhered them on top of the scallop punch. 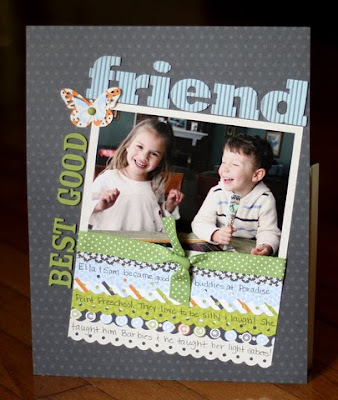 This simple added embellishment, simply gives this layout a heartwarming feel! An absolute adorable page! Christa, used border punches in a great design. She used two different border punches, and wrote her journaling between them! Clever use of leaving space between! She also layered a butterfly punch, and included this element in her title! The entire design is fabulous! Wow! Thanks to the design team members for playing along!! What a great way to end the week! Today, is my last post on the blog, and I had such a fabulous time! Thank you for allowing me to share some of my favorite things! Come back on Monday, because another inspirational challenge will begin! Happy Friday, and enjoy the weekend!